Success in today’s networked global environment with rapidly increasing stakeholder expectations and often in the fishbowl of social media requires constantly examining key strategic aspects of your business to ensure they are working together and efficiently contributing to short and long-term results. Smart leaders and successful organizations continuously scrutinize finance, operations, marketing, HR, engineering and other key areas, fine-tuning as required to optimize value and impact and drive the results that investors demand. They know that success requires vigilance, engagement and strategic integration. These same leaders, if you ask will also speak of how important social responsibility and sustainability are to their business, often citing specific projects and activities. The smart ones amongst them, those much more likely to succeed in the fast-paced and integrated world of Business 2030, realize they need to bring CSR and sustainability to the core of their overall value strategy. They know that simply allocating budget once a year and putting someone in charge of it isn’t enough, in fact, that approach is often a waste of shareholder’s money and corporate resources. Smart leaders recognize that CSR and sustainability can create real value across all aspects of business operations. From hiring and employee retention (effective CSR can be one of your strongest recruiting assets), to finance (Blackrock, the world’s largest investor, and many others have integrated societal impact and engagement into investment decisions), to marketing (value-chain impacts are increasing important from consumer markets to B2B industrial services), engineering (natural capital/natural resource process design efficiency is key to cost management, regulatory approval and social license). I could go on. The key point is that social impact and environmental stewardship can create value and competitive advantage across all aspects of business and operation. Simply throwing money at some charitable cause or philanthropic activity won’t do it. And will often be a waste of money and resources. 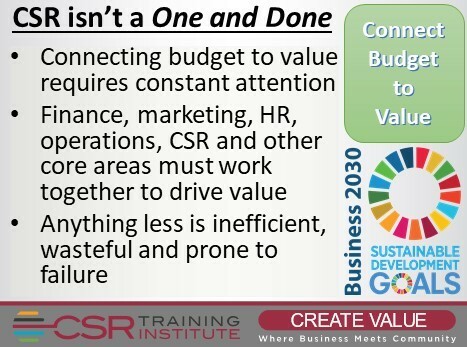 The road from budget-to-value has to be strategically connected and continuously examined. The problem is, CSR isn’t a self-driving Tesla. You can’t turn it loose and trust blindly that it will end up in the right place, contributing to overall value and competitive advantage for your business. Leaders and companies should know this. After all, it doesn’t work that way for capital and operating budgets. It doesn’t work that way for marketing budgets, or any other area of business. So why would it work for CSR? If anything, CSR is more like driving manual transmission car: you need to pay close attention, and change gears when necessary. Parameters can change, circumstances can change, and you need to be ready to change with them, sometimes at a moment’s notice. For example, many CSR and Sustainability leaders need to have more, and more meaningful internal engagement. Consistent business value conversations with key internal stakeholders can make for more effective performance frameworks, and much broader buy-in and engagement across the firm. This isn’t always easy. 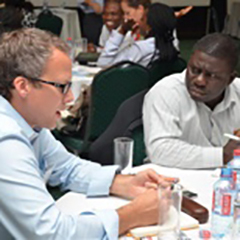 When CSR team leaders sit down with executives and managers from throughout the business the tendency of both parties is to talk about the social and environmental value dimensions. It can take a lot of work to pull the conversation back to meaningful thinking and input about how a particular CSR project can create (or destroy) value for Finance, or Engineering, or HR, or other business areas. But having this conversation is crucial. Force it if you have to. Help the company to think and engage on all dimensions. If you’re successful, you will not only have a better understanding of the internal value propositions, you will have broadened ownership and buy-in, and helped position your company for success this year and beyond. If you want to learn more about how to connect your CSR and sustainability programs to business value and make CSR a source of competitive advantage, contact us for a complimentary one-hour consultation.